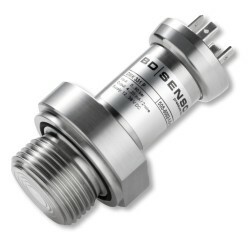 Screw-in pressure transmitter with flush stainless steel 316L diaphragm for measuring pressures of fluids with very high viscosity from 900 psi up to 6000 psi gauge or absolute. Options available for high temperatures up to 300 deg C and intrinsic safety. Special Options: Intrinsically safe version with II 1 G EEx ia IIC T4 approval, Integrated high temperature cooling elements for 300 Deg C media operating temperature, food grade oil fill. The DMK-331-P viscous media pressure transmitter is designed for use with media which is likely to clog a pressure connection such as paper pulp, adhesives and paint. For high temperature applications a cooling element can be specified allowing the DMK 331P flush pressure transmitter to be used on temperatures up to 300 degrees Celsius or 570 degrees Fahrenheit. The DMK331P flush pressure sensor can be provided with hazardous area certification for use in zones where flammable gases could be present. Will the cooling element have an affect on the pressure reading if the test media and the sensor are at different temperatures? The pressure reading is affected by the temperature at the pressure sensing device, which in this case is set back from the test media by the cooling element. The pressure reading is compensated for temperature changes within the limits stated on the product data sheet below. The compensated temperature range reflects the range expected at the sensing device, assuming the test media is within -40 to +300degC, the ambient temperature is within -40 to +85degC, and both temperatures are not below -20degC. We need a sensor for a gas application, on temperatures between 20°C and 275°C, and a pressure range between 0 psig and 750 psig. The gas consists of CO2 and steam. We would suggest a high temperature configuration for the DMK331P with integral cooling element and FFKM for protection up to 300°C. Is the DMK331P available with Australia Ex intrinsic safety approval? The DMK331P is IECEx approved and Standards Australia is one of the many member bodies around the world that recognise the standard as an equivalent level of safety to their domestic standard. I am looking to purchase a 4 bar g range DMK331P flush diaphragm pressure transducer, but I cannot see this pressure range on the data sheet, we have used this range in the past so please could you explain what has happened to it? The DMK331P is no longer available for ranges from 1 bar up to 40 bar and the ranges now start from 60 bar g. However, there is an alternative that is almost identical, called the DMP331P which is a stainless steel flush diaphragm pressure transducer. The main difference between the two devices is that the DMK331P has a ceramic strain gauge sensor inside the oil filled capsule whereas the DMP331P has a silicon strain gauge sensor. How are the electronics inside the DMK331P flush diaphragm pressure sensor protected from media at 300 degC? The electronics and sensing components are set back from the hot media by placing a cooling element between them. The cooling element is an oil filled tube with a series of coupled hollow disc segments along its length to increase the surface area for cooling, which keeps the tube length to a minimum. I need to measure pressure precisely in a hydraulic system delivering a hot sealant material mixed with nitrogen gas. System pressure is 7 bar and the temperature is 180 degrees Celsius. I also need an appropriate digital readout for the sensors, the speed of measurement/response of the sensors is critical. Can you advise? For measuring hot sealant material at 100 psi and 180 degC we would suggest selecting the option for a 300 degC cooling element which will protect the sensor from high temperature. The sensor also has a flush diaphragm to prevent any sealant from blocking any holes and preventing it from working correctly. The DMK331P electronics has a response of 10 msec. The flush diaphragm and oil fill volume are relatively small even with the integrated cooling element, so the sensor will be very responsive to changes in pressure. For the display we would suggest the 2400 Multi Channel Digital Indicator mainly because it has a display with a fast update rate as low as 2msec. 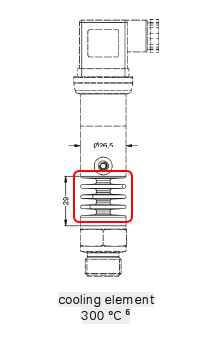 Please select the options you require for the DMK331P Flush Diaphragm Pressure Sensor in your application and request a quote. Send us your enquiry for DMK331P Flush Diaphragm Pressure Sensor to get assistance with this product type.